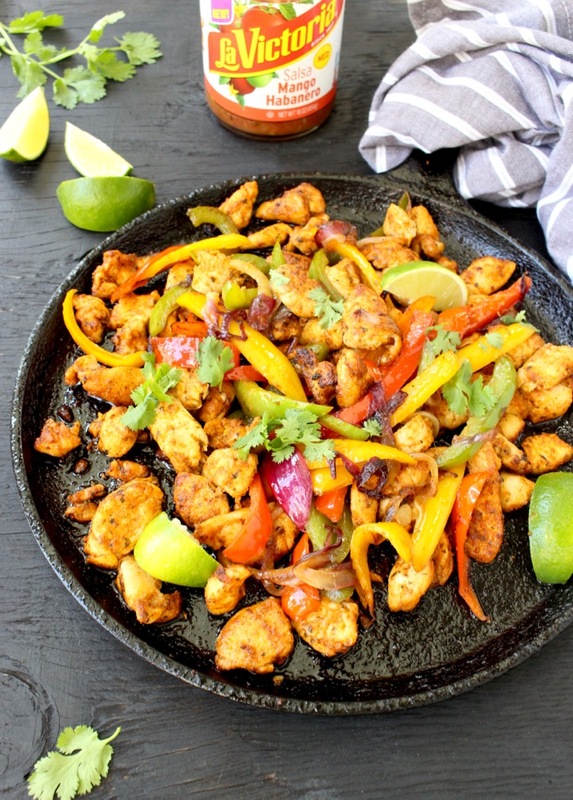 Nothing beats this quick and easy chicken fajitas recipe, loaded with smoky flavors and cooked in one cast iron pot. 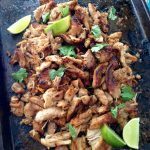 If you have 15 minutes, you can have these easy chicken fajitas in front of your family and ready to dig in! Because nothing beats a good chicken dinner made in one pot in 15 minutes. Are we in agreement ..? Also, 15 minutes of cast iron cooking in a nice cool kitchen beats grilling outdoors in 100”F weather. Are you with me on this one ? Of course you are! Many thanks to LA VICTORIA® Brand for sponsoring today’s story and encouraging me to try this delicious Mango Habanero Salsa recipe! Honorable mentions prizes: Number awarded at discretion of brand and may include a variety of the following: grill kits, branded t-shirts, cinch sack, lip balms, stickers, etc. So kids, all we really need to do is slice up some bell pepper, purple onions and chicken tenderloin into strips. 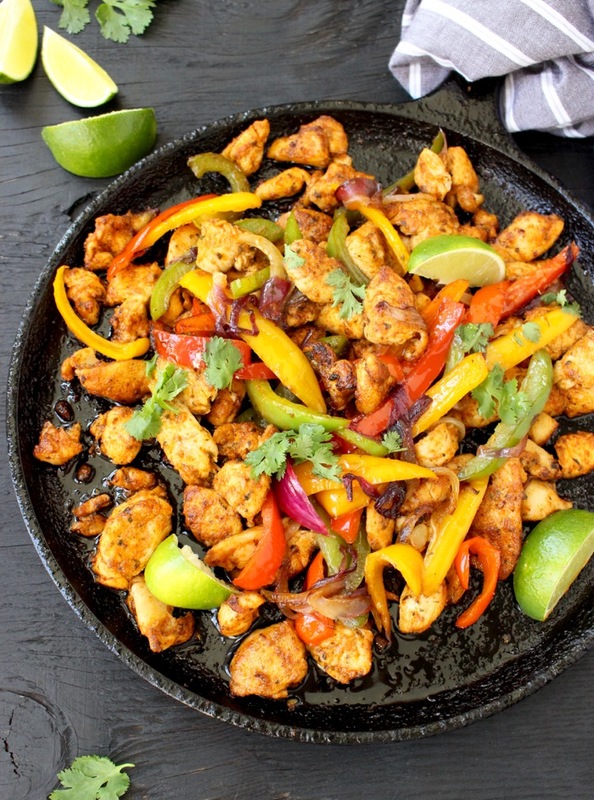 Then toss that chicken well in my magical smoky fajita spice mix and sizzled it to perfection on a hot cast iron skillet. Same idea goes for the peppers and onions. Then you bring them all together in a sweet embrace. 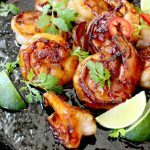 Drizzle some mango habanero salsa on top and forget about it! You just dig in like nobody’s watching. 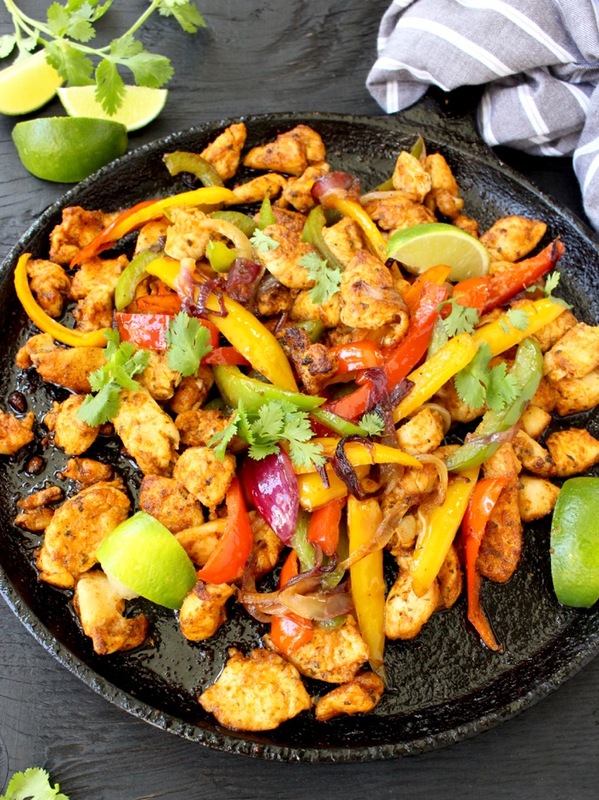 Best part about these easy chicken fajitas ? Truth is you can’t lose with a dish like this on a hot summer day! 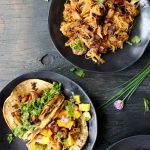 I’ll warn you tough, you might just be tempted to skip the burgers this 4th of July weekend and go for these easy chicken fajitas instead! If you still wanna grill burgers too, then you must go for this timeless Ultimate Burger i made for us a while ago. That is all from me today, hope you are having a wonderful Holiday weekend, and as always, please report back to mama with the goodies that you’ve made. 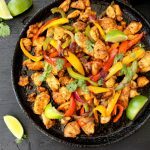 Quick and easy chicken fajitas recipe, loaded with smoky flavors and cooked in one cast iron pot. In a mixing bowl combine together 2 tablespoons of the olive oil, Mexican seasonings, smoked paprika, cumin, garlic and onion powder, pepper flakes and seas salt. Mix well to combine. Add a little more olive oil if needed. Add the chicken tenderloin strips to the bowl with the fajita seasoning mix and toss to coat well all over. Set aside to rest at room temperature for 15 minutes. Meanwhile slice the bell peppers into strips. Add them to a bowl together with the sliced red onion. Drizzle with a lug of olive oil and a pinch of sea sat. Toss to combine. Heat up a large cast iron fajita skillet on medium high flame. Add a tiny drizzle of olive oil to coat the bottom. Using a pair of tongues transfer the bell pepper and onion mix to the hot skillet. Cook for a couple pf minutes until a few charred marks form. Transfer the pepper and onion mix to a bowl and keep warm. 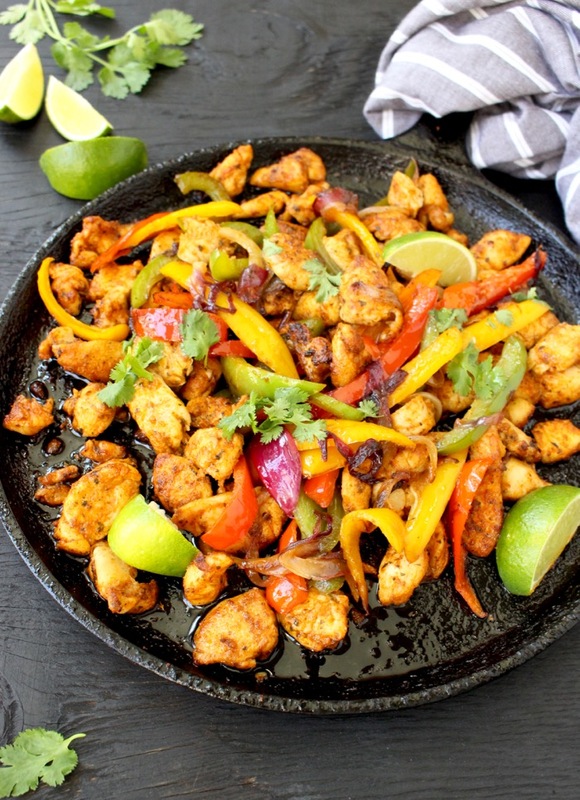 Carefully add the fajita seasoned chicken strips to the hot skillet and cook for a couple of minutes until nicely seared and cooked through. Work in batched if necessary. Add the pepper and onion mix back to the pan with the chicken and carefully toss it together to combine in all the seasonings. 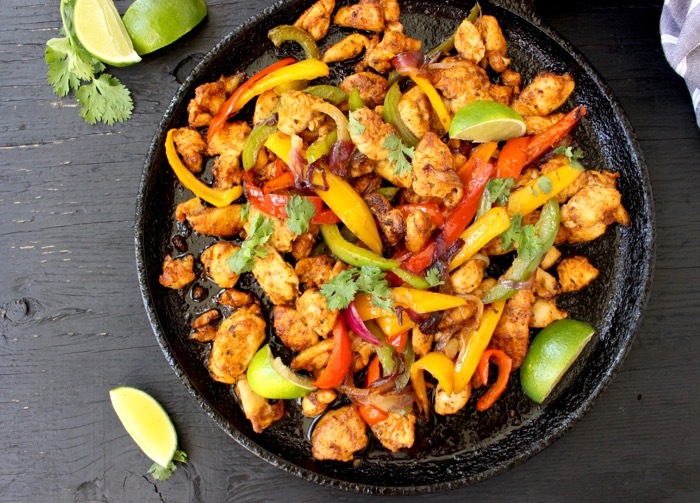 Squeeze the lime all over the top of your chicken fajitas and serve sizzling hot with the Mango habanero salsa on top. Garnished with the fresh cilantro and extra lime wedges. Enjoy with tortillas or on top of rice. Looks super super tasty!! 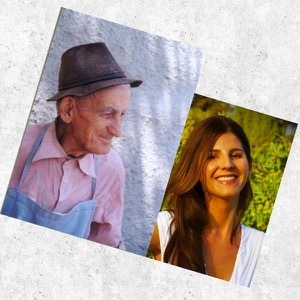 Do you still use only an iPhone for all of your photos? They’re so great. Looks so good! I can’t wait to try making fajitas. Yum! Pinned for later.